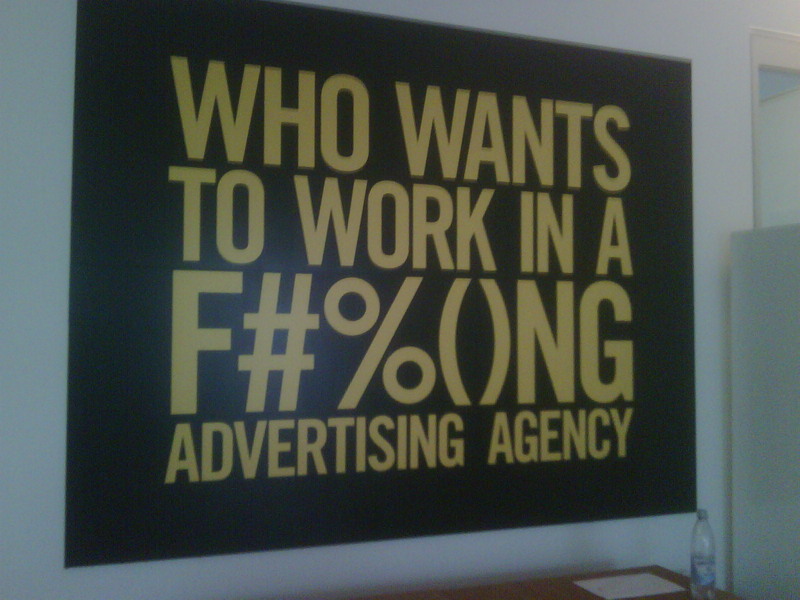 Who wants to work in a F#%()NG advertising agency? This is the message on the wall at TBWA Berlin (and all other TBWA offices? ), where I recently spent a couple of days at a ‘Disruption’ workshop they ran for one of our clients. ‘Disruption’ is TBWA’s brand planning process, their rigorous approach to earning a brand a greater slice of ‘share of the future’. The process works through the conventional wisdom of a market (‘Convention’), using that to work out how a brand can behave differently (‘Disruption’) and developing these into an effective future for the brand (‘Vision’). They’ve published a number of books on the process, and deeply embedded the approach into the agency’s planning culture, with workshops run frequently in all offices. The Berlin event however, with 50 participants, was on a much bigger scale than normal. A huge amount of effort had been put into preparation with data, insights and campaign creative collected on to large floor to ceiling boards to set the scene and inspire. They had even converted a number of offices and spaces in to home environments (kitchen, living room, adult and child’s bedroom). The cherry on the pie was that after they’d shown some vox pops of consumers (diary studies around product consumption), a couple of the families actually came in and took questions from the workshop! The process produced some really powerful territories, but most importantly, it built momentum within the client business behind embracing something new and fresh. Specifically these territories are about brand behaviour, not advertising, and inform the whole communications mix – not just advertising.